The City of London‘s Street Scene programme involved restoring the Monument, pedestrianising the space around the Monument, creating a new public garden on the Canoe House site and building a new pavilion which includes new automated public conveniences and staff facilities. 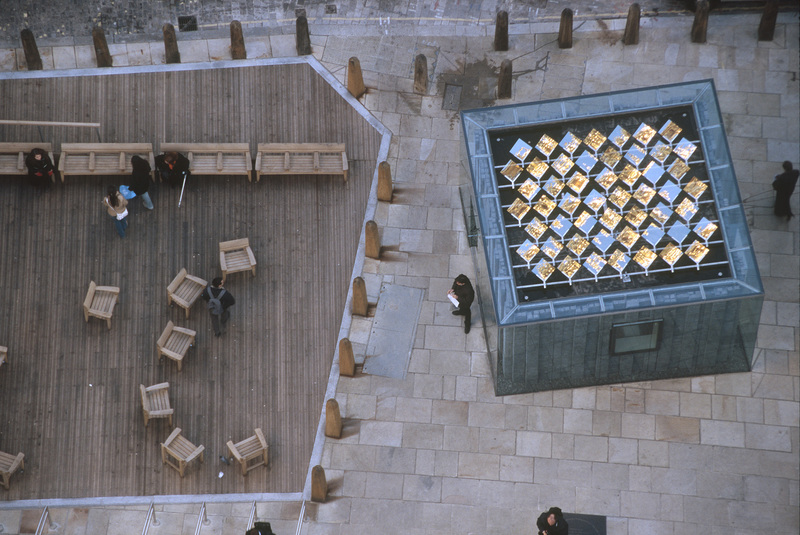 Both the pavilion and the garden were designed as part of a new arts strategy for public spaces in the City of London. The design for the pavilion was conceived as a discreet and functional sculptural element to sit within the new public space. The material chosen for the pavilion was Caithness Stone, the same dark stone that was chosen for paving Monument Square. The stone has been enveloped in glass. It was intended that the glass would be patterned to work with the gabion mesh to create a moiré effect. 100 small panels of glass are positioned on the pavilion’s roof, each piece tilted precisely so that visitors to the top of the Monument will see a shimmering vision of the gold orb on the top of the Monument reflecting up at them.